Grow up. Go to school. Move out. That’s how things should go for many students and parents, but the recent recession put a wrench in that plan for many of people. More young adults lived in their parents home in 2011 compared to 2005, according to Census.gov. Nearly 59 percent of men age 18 to 24 lived with their parents in 2011, up from 53 percent in 2009. 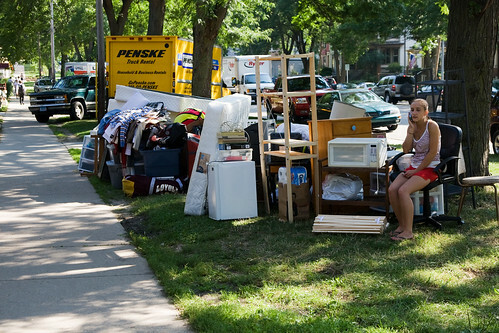 As the economy gains momentum, more recent graduates and young people are in a position to move out. That’s an exciting and terrifying proposition to many accustomed to home cooking, family support and other comforts of home. There are some hard and fast rules for living on your own for the first time: #1, don’t drink the last of your roommate’s beer. Rule #2, pay your bills. We’re here to help with the latter. Try these practical tips to save money and keep out of your parent’s place for good. Cable is a significant monthly bill, but the Internet is making it less necessary. Online streaming movies, TV shows and sporting events provide cable shows without the monthly bill. Video stores continue to close and DVD sales continue to slide, largely due to the fact that streaming services have made them obsolete. If you don’t mind repetitive ads and a few seconds of buffering, avoid cable and catch up on your favorite shows online. You’ll be off to a fast savings start. It may go without saying, but land line telephones are going the way of the Dodo bird. Chop this unnecessary expense off your budget if you’re still taking calls at home. Cell phones are more convenient, more capable and more 21st century. We know, coupons are for old ladies. Keep track of your grocery store purchases for a month. We think you could learn a thing or two from grandma. Coupons can be found online and in your local paper (ask your parents which day). A free meal here and $2 there goes a long way over the course of a year. Try it for two weeks, even if you’ve never pictured yourself as a coupon junkie. Small habits could buy you that new car in a couple of years. We don’t all have the luxury of biking to work. If you live close to your employer, think long and hard about hopping on a two-wheeler. You’ll save money on gas, parking and insurance. Along with these wallet boosters, you’ll also get exercise and decrease your carbon footprint. It’s tough to find a reason to say no if you live anywhere near work. Whether you’re eco-friendly, savings-conscious or exercise-driven, biking to work will benefit your life.